Before the Wall is Built, DailyPUMA makes suggestions about the Wall and its Purpose. In the Tug of War struggle as to whether or not the U.S. should build a wall, DailyPUMA has come up with some ideas that might make The Wall palpable to many Americans currently against The Wall. As one approaches The Wall what if there is actually an indent, perhaps 60 feet wide, maybe the indent is 500 feet deep. The indented, shaded spaces become a gathering place for those who wish to come to America. In these indented spaces, perhaps all kinds of commerce is going on. Instead of paying a coyote 10,000 dollars to sneak a person into America using life threatening methods, the goal instead becomes reaching one of these Wall indents without needing a coyote at all. A person can hang out, there would be fast food outlets, relaxed atmospheres, places to freshen up if necessary. Perhaps there would be Skype like interaction with the American people where arrivees communicate with those in America. Towns hungry for workers might want to check out those who have dreams of coming to America. Businesses who want to export their Franchise idea might want to help a dreamer develop a franchise location in Mexico. An immigrant trying to cross into America would have their chance to "pitch" an American citizen to "Sponsor" them. The American citizen would take responsibility for the person pitching them to come into the country, perhaps even live in their home as a guest. Think of it as Shark Tank for Immigration. There would be free bus rides back to Mexico leaving every hour, every day for those who gave it their best shot and now go home hopeful that the interaction they had with America in some way may bless them in the future. And all would be welcome to come back. But other things would be simultaneously be happening. Mexican citizens would meet each other, friendships would form. Meeting someone just as determined as they are to make a better life is kind of a good thing, even if both go back to Mexico to wait and see if someone accepted their pitch to come to America. Maybe there would be American sponsors who would be willing to provide a new business enterprise in Mexico. Maybe the types of business that the Americans would sponsor would be in operation within the indents. Maybe as new relations form, the drug cartels hold on Mexico weakens as more and more friendships mean more and more caring against those who think nothing of killing to create fear. Maybe the drug trade would slow down as Americans hear all the problems they are causing in Mexico when they buy drug cartel drugs from their local drug dealer in America. DailyPUMA sometimes thinks what gets forgotten is the desire to have hope and future dreams. Building a Wall does nothing for dreamers. Building a Wall that actually welcomes people to come and interact at The Wall might be the outcome that would actually satisfy many people currently on the fence. How Trump can Build his Wall. "Help Wanted, Illegals only need apply." Help Wanted, Illegal immigrants only. Work on The Wall and you will be given temporary housing, and upon completion of your part of the wall, you will be granted American Citizenship. You will also receive a free t-shirt that says, "I helped build the wall and all I got was this fantastic T-Shirt and my U.S. Citizenship". What I find strange about building "The Wall" is it was not that long ago that Ronald Reagan told Eastern Germany to "Tear Down that Wall", and now suddenly the United States is going to build it's own wall? If the wall is built, I believe people trying to get into the country will be catapulted over the wall with a mini landing parachute. Once over the wall the parachute will be set free so that it blows off course and does not provide a clue as to which way the catapulters went. Trump with Lowest Presidential ratings after 100 days going back 70 years, But, 96% of those who voted for Trump would do so again. If you are a Democrat Moderate, please don't believe everything that the Progressive Media tells you, or the WAY that they tell it to you. Most Progressive sites will state that Trump's Presidential ratings are the lowest after 100 days of any President going back 70 years. DailyPUMA will tell you that, AND DailyPUMA will also tell you that 96% of Trump's supporters still back him. DailyPUMA has already warned readers of this column that no matter how unpopular Mr. Trump is with Progressives, his base isn't running from him. Democrats Cheering over the Wrong Stuff as Mario Lopez hosts segment on Bill O'Reilly. DailyPUMA happened to catch the beginning of the TV show EXTRA the other night when the lead story was the firing of Bill O'Reilly. The irony was the Celebrity Host for the segment was Mario Lopez. DailyPUMA has read accounts that Mr. Lopez was one of the biggest hound dogs in his younger days as a Lead on the TV Show Saved by the Bell, and apparently, long after. and based on his autobiography, long before. Mr. Lopez admits in his own autobiography to losing his virginity at age 12, and it appears he doubled down going forward in his teens and early 20's, and apparently beyond that. Lucky for Mr. Lopez the Internet was not around back in the 80's to chronicle his advances on many many young woman who simply wanted to make their mark as an actress on Saved by the Bell and perhaps had to deal with his advances as well. So what is the connection to Bill O'Reilly besides Mr. Lopez hosting the segment? The Progressive way of thinking is, the uglier the man, the uglier the deed. A handsome man could do the exact same thing as a less attractive man, and Progressives would literally forgive the handsome one and then double down on the not so handsome man. This is why DailyPUMA believes in the superiority of a moderate democrat movement. The Moderates would treat both people equally. Will Mario Lopez ever face his 80's demons, and apparently those that may have followed him well beyond his 80's? If Moderates were in charge, possibly, with Progressives in charge, probably never, because Mr. Lopez is probably a democrat, and physically handsome by most accounts. Conservatives see someone like Mario Lopez hosting a segment on Bill O'Reilly's ouster and they just shake their head at Hollywood's double standard, and hold on even harder to someone like Donald Trump, whom they believe is the anti Hollywood candidate. DailyPUMA asks when do we see Democrats celebrating actual successes rather than Republican failures? Why isn't Japan freaked out about North Korea? If North Korea were to ever launch a nuclear device, DailyPUMA wonders if to save face a nuclear weapon headed for either Hawaii or the West Coast of the United States could end up in Japan instead if the intended trajectory was not going to reach its intended target. If I were an insane dictator who decided to launch a nuclear weapon, and it was not going to reach its intended target because the target was just too far away, would I want the nuclear weapon to fall into the ocean, or would I pick a closer target just for the insane rush of the moment? Does Japan have any defensive weapons for shooting down rogue nuclear warheads. Should they? US accuses Russia of creating New Fake News Event called Syria Hoax. DailyPUMA has almost been convinced by the mainstream media that Russia has started a cyber attack using the phrase Syria Hoax because they are desperate. However, from day one of the 2017 April Sarin Gas attack Russia has asked the U.S. to provide proof that Assad was directly responsible for the Sarin Gas attack. Calling the Sarin Gas attack a hoax now is actually consistent with Russia's position from the beginning. Wouldn't immediate access to the Syrian Missile base that allegedly has the Sarin Gas stored either confirm or quell the accusations against Assad? The entire Sarin Gas story almost feels like a "Don't Ask, Don't Tell" scenario in which bombs were lobbed by the U.S near onto the Syrian military base where aircraft allegedly with Sarin Gas took off from, but we the people in the U.S. still have no idea if there is a stock pile of Sarin Gas in Assads possession or if for sure he actually was responsible for the Sarin Gas Attack. Every single time the mainstream media definitively states that Assad was responsible for the most recent Sarin Gas attack, Stock Footage of U.S. Tomahawk cruise missiles Retaliatory Strike launched towards Assad's military base are shown. "Do you see what Assad did, he dropped Sarin Gas on his people which forced the U.S. to shoot missiles at his military base". That is plain and simple mainstream media led subliminal false messaging that causes U.S. citizens to correlate the Tomahawk missiles being shot into the night time sky against Assad's Military Base, with Assad's use of Sarin Gas. Responding to an alleged attack in no way proves who actually did the original attack. DailyPUMA suggests that if you see someone beating another person in the street, don't automatically assume the person being beaten started it unless you are shown proof. DailyPUMA pleads with the U.S. Media to show some tangible bit of proof related to the Sarin Gas attack that proves Assad did it. Showing the children suffering does not prove who or how or where or when the Sarin Gas was deployed. Did Donald Trump show any actual proof that the Syrian Military Base Launched Sarin Gas into Idlib, Syria? After 911, George Bush almost immediately claimed that his administration had definitive proof of who had launched the 911 attack, and he went forward with the War in Afghanistan and a couple years later the War in Iraq. If DailyPUMA recalls correctly, the American people were never shown any evidence outside of pictures of whom U.S. intelligence believed were the terrorists on board each plane. Now Donald Trump is claiming that a Syrian Military base gassed its own people with Sarin Gas in an area that is held by rebel forces. But apparently no actual proof that the Syrian Military base launched the Sarin Gas has been provided. Instead we are being shown American missiles launching from an American Battleship, and then we are being shown satellite imagery of the missiles hitting their mark at the Syrian Military base. Russia basically has asked, where is your proof that this particular Military base fired the Sarin Gas? As Clara Peller famously said in the 80's and what we should all be asking now is, "Where's the Beef"? 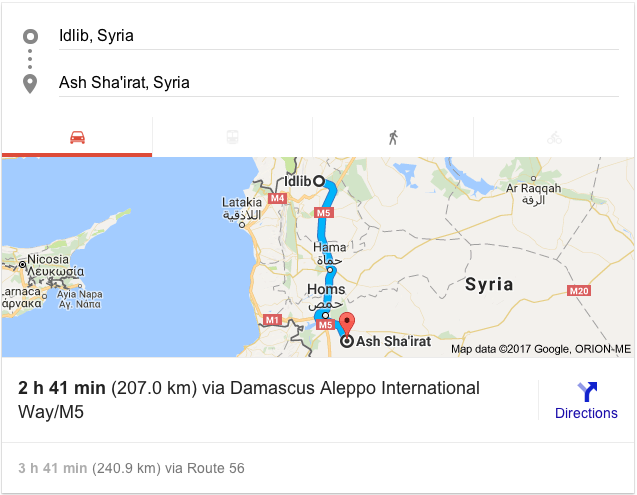 Where is the actual proof that the Syrian Military Base fired Sarin Gas into a rebel held enclave 128 miles away in Idlib, Syria. Was it missiles that were fired, or were military planes sent on this Sarin Gas mission? Was it one military plane, or was it several? Did U.S. Military intelligence pick up the military planes on radar? 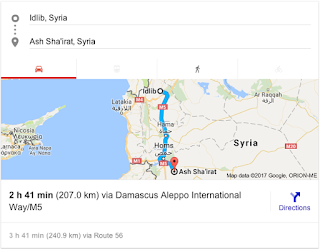 Assuming the military planes were traveling between 300 and 500 miles an hour, that would mean it took around 20 minutes to arrive in Idlib, Syria from the Syrian military base in Sha'irat, Syria, and then another 20 minutes to get back home. Wouldn't the Syrian Military planes have taken a flight path over the ocean to avoid any rebel attempts to shoot down their planes if planes were used? That would add time to the flights as they ventured off into the ocean and then took the ocean route and then veered back. Perhaps we are now talking 25 minutes to 30 minutes in each direction if Syrian Military planes actually dropped the gas. Wouldn't the U.S. battle ships have seen the Syrian Military planes flying over the ocean since they were somewhere nearby, no? If missiles were used to drop Sarin Gas, the amount of propulsion needed to send the rockets 128 miles would probably mean some type of significant explosion when the the missiles either dropped their payload or crashed into the ground. NONE of these scenarios are being discussed, we are all being herded past this point and into just what our bombs actually did, and the world's alleged support of Trump's actions without evidence. Remember when the Republican Fake Newsers were outraged because Barack Obama and Hillary Clinton refused to credit the Terrorists for the Attack on Benghazi? The Republican media machine, and those infested Hillary Clinton Derangmeent Sydrome, were outraged when both Barack Obama and Hillary Clinton refused to credit the terrorists for their attack on a Benghazi outpost several years ago. The Democrats blamed a video for the Benghazi attack. In the real world, this is known as deflection so that the Terrorists are not credited with a "victory". Unless of course one is a demented Republican operative who only cares about damaging the Democrat President and his Secretary of State. Encouraging and energizing terrorists is but a pointless sidebar issue when it came down to the Clinton Derangement Syndrome traitorous neanderthal's desire to harm the reputation of Barack Obama and Hillary Clinton. Donald Trump just ordered an attack against a Syrian Army Base that allegedly launched Sarin Gas via missiles. What did the Russians say in response? The Russian military said only 23 of 59 cruise missiles reached the airbase and it reported that six Syrian jets were destroyed, according to PA. Earlier, Russian media reported that nine planes were destroyed in the strike, but that the runway remained relatively unscathed. Gosh, imagine that, the Russians have reported that LESS than half of the missiles launched from a U.S. battleship reached their target, and that the U.S. was incapable of even making a dent in the runway. See how that works, the under reporting of damage done is just a common practice among countries who suffer some type of injury in an attack. Unless of course, it is the Republicans basically committing treason by questioning the military tactic of raising false flags to demoralize ISIS under a democrat presidency. DailyPUMA is asking CBS and the NCAA to Rebroadcast the 2017 NCAA Women's Final Four O.T. Thriller between UConn and Mississippi State during Prime Time. Near the end of this day you will get a chance to see the NCAA Mens 2017 basketball Championship final between North Carolina and Gonzaga on CBS, during what is known as prime time. DailyPUMA believes that the NCAA Women's 2017 Final Four Basketball game featuring 111 game winning streak UConn vs Mississippi State should be rebroadcast during prime time on a major channel such as CBS. The final four match-up between UConn and Mississippi State was originally broadcast on a Friday evening on ESPN 2. The game turned into an all time classic that went into overtime and also featured a last second shot in overtime to end UConn's 111 game winning streak. Unfortunately, Democrats are spending so much time being angry at Donald Trump that they have missed a perfect opportunity to engage Middle America in one of several areas where it counts, Sports. DailyPUMA has stated in the past that Healthcare Advocate Hillary Clinton and her perceived lack of physical fitness will most likely derail any future attempt of hers at becoming president. But along with that, DailyPUMA thinks that all of the Female Democrat Leaders who are trying to break the glass ceiling are completely out of the loop when it comes to both physical fitness and sports in general, and Women's Sports in particular. While Hillary Clinton drafts yet another speech for another public speaking event, yawn, make that a double yawn, UConn and Mississippi female basketball players played the game of a lifetime. But the game was to some degree buried on ESPN 2. If you didn't have cable, you could not see the game on your television unless you figured out a way to stream it. There are tens of millions of impoverished voters who get FREE HD TV via their antenna set-up, not one of them got to see the UConn vs Mississippi game via their antenna because ESPN or ESPN 2 is not on Free TV, but CBS is. DailyPUMA would not be surprised if Donald Trump picked up 75% to 80% of the FREE TV audience vote for 2016 presidential election. A crafty, in tune Democrat Party, especially the Women in Leadership positions who proclaim to represent all women and the future of women, should have been asking CBS and the NCAA to rerun the UConn vs Mississippi basketball game in prime time on CBS. The very next night, Saturday Night, might have been the perfect encore night if it could have been squeezed around the Men's final four contests. However, with reruns coming soon to CBS, any prime time night in the very near future would be an acceptable alternative. I am willing to bet that all the self appointed female leaders of the Democrat Party, Pelosi, Clinton, Warren, are completely clueless about sports and thusly not only did not have the idea to suggest to CBS and the NCAA to rebroadcast the UConn vs Mississippi State overtime final four thriller in prime time on CBS, they also don't have the proper consultants who are truly connected with Middle America to alert them to such a positive idea and proactive idea for all women, and men to. This is why for every woman the Democrat Party loudly and proudly represents, there is another woman who is put off by the Democrat Leadership talking a good game yet being so out of touch with what would connect them to Middle America. No Democrat who is attached to Hillary Clinton has ever asked DailyPUMA's opinion on anything, even after DailyPUMA's 8 years worth of topics which culminated with DailyPUMA's Oct. 27, 2017 prediction that Hillary Clinton could win the popular vote by 1% but lose the electoral college vote, and therefore needed to reach out to Jill Stein and Gary Johnson. DailyPUMA is asking CBS to pick up the ball and rebroadcast the UConn vs Mississippi State 2017 Final Four game in the very near future, and to broadcast the game in prime time and give it the pomp and circumstance this particular game richly deserves. Until CBS rebroadcasts the UConn vs Mississippi State 2017 Final four game in prime time, we will continue to be bombarded by the overhyping of men's sports while female sports continue to play a distant second. Debunking the Claim by The Federalist Papers that Hillary Clinton Won California but lost the rest of the country by a 62% to 38% margin. The Federalist Papers meme that Hillary Clinton won California by a huge margin but lost the rest of the country by a 62% to 38% margin is simple math gone wildly wrong. The Federalist Papers just can't throw out 55 electoral college votes for Hillary Clinton and then say that Hillary Clinton did poorly in the rest of the country, it's sheer lunacy and disingenuous. The Federalist Papers simply forgot to do the other half of the equation in their quest to prove a mathematical point. The Federalist Papers forgot to REMOVE 55 Electoral College Votes from the Trump States that had the highest winning percentage for Trump, afterall, that is EXACTLY what they did with Hillary Clinton's numbers. DailyPUMA did the calculations and found the top 9 Republican states with the biggest percentage of votes for Trump that also equaled California's 55 electoral college votes. So what happens we throw out the 9 Trump states with the largest winning percentage and electoral college vote total of 55? Although Hillary Clinton's total popular vote margin of victory dropped by 1.16 million votes, Clinton still remained far ahead of Trump in the popular vote by 1.7 million votes. So when California is removed from Hillary Clinton's electoral college total and from her popular vote total, and Donald Trump's nine largest winning percentage states that also equal 55 electoral colleges are removed from his electoral college total and popular vote total, Hillary Clinton still wins the popular vote in the remaining 40 states by 1.7 million votes. The Federalist Papers has put out a ridiculous and misleading claim when they state their 62% to 38% claim. "But, but, what if we subtracted California AND New York, then Donald Trump would be more popular"…lets do the math there as well. We now remove New York's 29 electoral college votes and the next three Republican states with the widest percentage of votes for Trump, and that also equal 29 electoral college votes. We get New York with 1,701,118 popular vote lead for Hillary Clinton minus 1,351,981 votes when the three Republican states with the largest winning percentage that equal 29 Trump Electoral College Votes are added together. Thus Trump gained approximately 350,000 votes against Hillary Clinton's total popular vote. When California and New York popular total votes are subtracted from Clinton's popular vote total, and when Trumps 12 largest winning percentage state popular vote totals that also equal the exact same number of Electoral College Votes as California and New York, are then subtracted from Trump's popular vote total, Hillary Clinton still wins the Popular vote by 1.3 million votes in the remaining 36 states. So screw you The Federalist Papers for fabricating a 62% to 38% margin of victory from every state not named California, your math was basic cherry picking 101, pure and simple, and your results were completely misleading. Hillary Clinton WON the popular vote over Trump by 1.7 million votes when California and a equivalent number of Republican victories in the states with the highest winning Trump percentage and equivalent electoral college vote of 55 are removed. When California and New York are removed from the Clinton win column and a corresponding number of electoral college votes from the largest winning percentages from the Trump State victories are also removed, Hillary Clinton still wins the popular vote by 1,350,000 votes in the remaining 36 states. If we reverse engineered The Federalist Paper's argument, Clinton supporters could make the following claim, "If Donald Trump had not won Texas, Trump would have fallen short of the 270 delegates needed to win the presidency. So, if we throw out Trump's biggest win, Texas, not only does Trump not win the presidency, but Hillary Clinton's popular vote lead swells to 3.73 million votes".